(Oct. 16, 2013) -- The UTSA College of Sciences (COS) will host the 2013 COS Research Conference from 8 a.m. to 5 p.m., Friday, Oct. 18 in the University Center on the UTSA Main Campus. 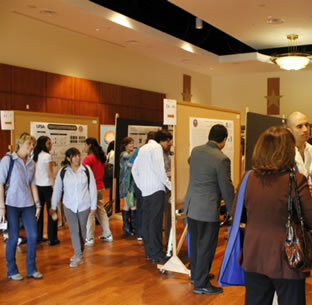 The research conference will feature nearly 600 participants from universities across South Texas. This year's theme is "Collaborative Basic and Translational Research in the Sciences” and will include exhibitor booths and more than 300 scientific oral and poster presentations by students, faculty and researchers. Additionally, nearly 60 area high school students will be in attendance. In conjunction with Cybersecurity Awareness Month, Ravi Sandhu, UTSA Lutcher Brown Endowed Professor of Cyber Security, will provide the 3 p.m. keynote address, "The Science, Engineering, and Business of Cyber Security." UTSA students and faculty, and researchers from across South Texas will make presentations representing various disciplines including neuroscience, stem cells and development, infectious diseases, physics and astronomy, chemistry and biochemistry, computer science, and earth, energy and the environment. For more information, contact Cheryl Negrete at 210-458-5168.